We are so excited to share with you previews of our April/May Release stamp sets. We have 8 stamp sets and their coordinating Digital Elements releasing on May 1 2015 plus some cutaways! We are releasing Sparkle for purchase as part of our April/May Release. 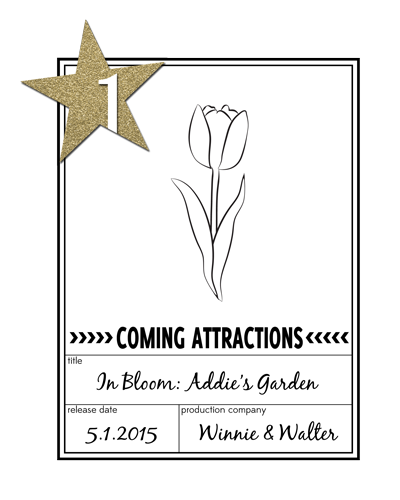 We are bringing on the flowers in a *big* way with In Bloom: Addie's Garden! Julie has outdone herself with this stamp set full of beautiful blooms in the same style as the roses in The Big, the Bold and Extras! This is the first in a series of all flower and leaves sets in this style and we could not be more thrilled! We are so excited to share In Bloom: Lola's Bouquet with Joni Andaya which we designed with the uber-talented Joni Andaya. With a multitude of possibilities in little flowers, leaves and containers and unique layering options you know with Joni behind the design you will be making gorgeous projects! 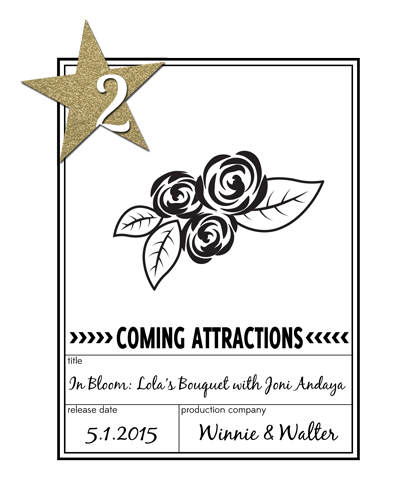 Be sure to check out Joni's blog throughout our Release Week for more inspiration with In Bloom: Lola's Bouquet with Joni Andaya! Mini Scenery: Multifaceted brings a very graphic little backdrop to your projects. This stamp will work for projects for any gender and age! Gems are all the rage and we certainly love them too so we created My Precious to add a touch of glamour to your projects. With some sentiments that will blend perfectly with other sets like Sugar Rush and Sparkle (releasing May 1) this is not only a beautiful stamp set, but a useful one too! True is a perfect companion to My Precious and Mini Scenery: Multifaceted. With faceted basic shapes and sentiments you can make a project for the guys and gals in your life including mom and dad! We've added another set to The Big, the Bold series. The Big, the Bold and Comfort is a "Texas" sized set with 5 big words! This set will help you be there for friends and family when they most need some kindness in their lives. A compliment to The Big, the Bold and Comfort is The Big, the Bold and Friends. Celebrate the friends by birth and choice in your life with this set! We are so thrilled to share more with you over the next few days as we premiere the stamp sets beginning tomorrow, April 28, 2015. The guest stars' and The Talent's projects are delightful! Loving those flowers already. So excited. Looking forward to the W&W florals and the new big words - W&W fonts are always fabulous. What? Wait... Lola's bouquet? My mom's name was Lola, as is one of my daughter's! Please save me one? Oh My! Flowers of any kind, or size, excite me, so I am really looking forward in a "big" way to seeing these...oh, and the geometries...oh and The Big, the Bold and Comfort, well, I live in Austin! I've tried to narrow down what I'm excited about and the result, after much deliberation, is EVERYTHING! Love the flowers, the geometrics, the words....Fantastic, every. single. one.! Looking forward to showcases! SO excited to see the flowers coming (and continuing!!!!) Thank you! I'm soo curious to see all the goodies and can't wait to see the DT's projects! Excited ! Loving it already! Can't wait to see what the DT have come up with those fabulous new stamps/dies! Oh how fun! I'm a sucker for florals! Wow, what a fabulous release. I love the flowers. I cant wait to get my hands on them and play around with my inktense pencils. I'm liking the sketchy flowers and the true hero! Oh boy, I can hear my wallet screaming already. I am looking forward to the new flower sets! Oh my - loving these flowers!! I'm super excited, there are so beautiful!!! I think that what I am most excited about is the tulip I saw in the In Bloom: Addie's Garden set!! What a delightful image - cannot wait to see more!!! Totally loving why I see so far! Can wait to see the full release. Love Joni's Lola's bouquet...looks like it's going to be fun! Really looking forward to the new release. Already get email, just signed up for blog follow, and I do go to your FB page, need to make sure to "like" your page, 'cause I do! Thank you for a chance to win. Can't wait to see them all..especially excited for Joni's flower set!! So glad to see the Big Bold and Comfort. Those sentiments are sometimes hard to find. Sparkle is just that, shiny and new too! Exciting! Love all the items in this preview! big and the bold!!! Love them all! I love the big bold comfort! It will be in my shopping cart!